Failed Democratic presidential candidate Michael Dukakis once suggested that elections should be about competence, not ideology. A year after winning the White House with a combination of ideological jousting and forceful technique, Barack Obama has been tested on both fronts. His approval ratings have fallen, and ideologically, liberals seem almost as unhappy with Barack Obama as do conservatives. Those on the right think Obama has revealed himself to be a flaming liberal (the word socialist has been tossed around), while those on the left have expressed disappointment with Administration decisions ranging from the troop surge in Afghanistan to the potential abandonment of a public insurance option for those without health care coverage. Rating Obama's first-year performance in terms of ideology, therefore, rests in a purely subjective realm. 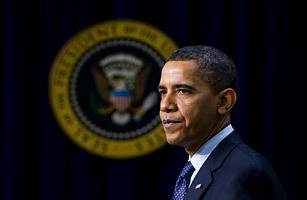 Rating the President on competence, however, is another matter. Obama proved his executive proficiency by running a successful underdog campaign against the more experienced Hillary Clinton and John McCain. Having inherited from the previous Administration a battered economy, two wars and a range of other thorny problems, it is fair to say that what success Obama has achieved so far in his new job owes to a level of skill his 2008 rivals predicted he would lack (rather than blind luck). But while the nation's 44th President has not been overmatched, he has not yet mastered the role either. Here, then, is a review of Obama's first year on the job.